Marie Claire Kidd speaks to the man behind the microphone. Last year’s BFA digital innovator of the year is making waves in farming and beyond as his Rock and Roll Farming podcast goes from strength to strength. In just over a year, Will Evans has established himself as a major voice in British farming. His friendly, laid-back style and undeniable enthusiasm has bagged him interviews with some of the industry’s most prominent figures, including NFU president Minette Batters and president of NFU Cymru John Davies. He has even interviewed Michael Gove, secretary of state for the environment, food and rural affairs, notoriously adverse to such conversations. Will publishes a podcast each week, and has built up an archive of more than 60 entertaining and informative chats, with everyone from British quinoa farmer Steve Jones to founder of Februdairy Dr Jude Capper, and from director of the AgriFood Training Partnership, Prof Carol Wagstaff, to Will’s 95 year old grandad, who shared memories of being an 18-year-old farmer and firefighter during the second world war. There were no huge investments required, just a microphone and a headset, a logo and the music to the show. I probably set myself up for about £300. A key feature for Will is to have a laugh with his guests. “The inspiration for this whole thing was Rob Sharkey, who does the Shark Farmer Podcast in Illinois in the States,” he explains. “He’s a great guy and really helped me out with getting this off the ground. His tongue in cheek manner can be seen regularly – take for example the time he talked to Yorkshire Dales beef and sheep farmer Neil Heseltine, a podcast he called ‘A Town called Malham’, a nod to the Jam song, ‘A Town Called Malice’. He has used the platform to explore other kinds of digital media, for example Facetime a Farmer, run by arable farmer Tom Martin, which enables farmers to connect with teachers and schools on a regular basis. And he has become increasingly interested in mental health for farmers. “I think social media and digital media give farmers the chance to communicate what we’re doing straight from the farm,” he says. “Ten years ago we couldn’t do that. “I think it’s also been a game changer in terms of reducing social isolation. We’re working more hours, there are less and less people working on farms. When Steven Parkinson shared his problems with depression via the podcast, there was a heartfelt response. One listener said it had encouraged them to recognise they had a problem and to seek help. “It doesn’t get better than that,” Will says. He launched the podcast in May 2017, having never interviewed anyone before, aiming to appeal to farmers and non-farmers alike. Will interviews somebody different every week, whether they farm big or small, conventional or organic, traditional or ground-breaking or have diversified into something totally different. “I hope to celebrate some the great diversity that’s in this industry,” he says. “There are some incredible characters living this life. I want to introduce some of them, find out about how they got into farming and why they do it. “I get frustrated sometimes with the way farmers are portrayed in certain sections of the media. The podcast is hosted by libsyn and is available through iTunes, Stitcher app, and other digital outlets. It averages 2,000 weekly downloads, and has featured in the ‘new and noteworthy’ section on iTunes. The show has been downloaded in 54 countries and Will has amassed 10,000 followers on Twitter. When asked who has been his favourite interview, Will does not hesitate. Balancing the demands of his life online with his work as a farmer is no mean feat. Will farms at Lower Eyton, a 202-hectare (500-acre) mixed farm, near Wrexham. The Evans family has been farming in the area for at least 10 generations and today Calves are bought in from a nearby dairy farm and finished, alongside 121-ha (300 acres) of cereals and has a free-range egg unit. Digital innovation in farming is burgeoning and more and more farmers are recognising the benefits of multi-media platforms to grow their business. From Twitter, Facebook and Instagram to creating websites and sharing videos, farmers have become savvy in showcasing their personality alongside their business or product. If you are using digital mediums to grow your business or promote the wider industry then tell us your story and enter this exciting award. 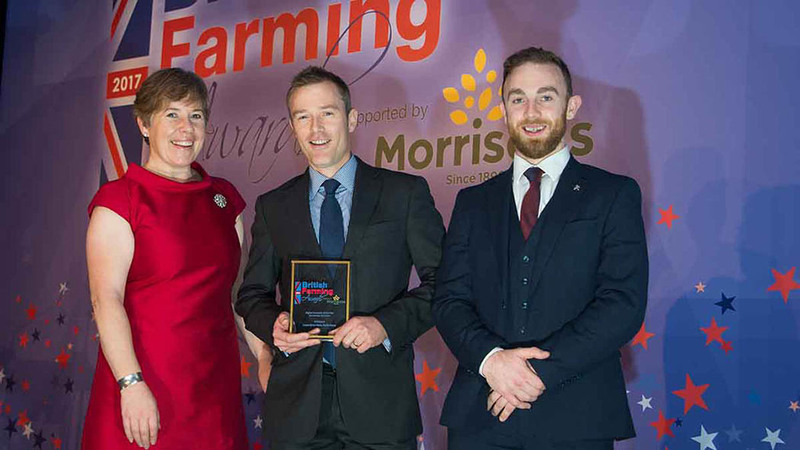 On winning the Digital Innovator of the Year award at last year’s British Farming Awards, Will confirms it has led to new opportunities he could not have imagined previously. “I know everyone says this but I absolutely didn’t expect to win it,” he says. “I was blown away. I wasn’t expecting red carpet photographers. It’s just a brilliant night, one I’ll never forget. “You don’t often get the chance to be recognised like that in your adult life. There were so many well-wishers. “Straight away I got a lot more people contacting me. Shortly afterwards NFU Cymru offered me sponsorship which covers my costs, and I’ve had other people ask me about sponsorship. Now I have a partnership with Farmers Guardian. “This is just something I do in my spare bedroom. To be associated with NFU Cymru and Farmers Guardian gives it a legitimacy I never expected. He is always looking for new guests, through social media, or via his growing contacts book. “I’m looking for people with an interesting story or doing something innovative, but I also like to speak to ordinary farmers, they can be equally interesting.